Senator Bernie Sanders waves after speaking during a Liberty University convocation. 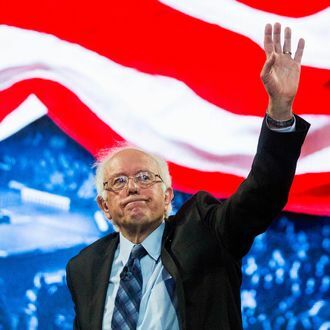 To win the presidency, Senator Bernie Sanders will need to win some converts. And like every dedicated missionary, the Democratic presidential candidate isn’t afraid to take his socialist gospel into potentially hostile territory — even to a Christian college founded by the late televangelist Jerry Falwell. At Liberty University’s convocation ceremony Monday morning, Sanders sought to recast his economic message in religious terms, arguing that America’s present income inequality is an affront to Christian ethics. Sanders isn’t alone in trying to refocus the political concerns of American Christians toward issues of economic justice. In his speech before the U.S. Congress next week, Pope Francis is expected to continue his argument against unfettered capitalism’s “idolatry of money,” a phrase Sanders heartily endorsed on Monday. “In the pope’s view, and I agree with him, we are living in a nation and in a world … which worships not love of brothers and sisters, not love of the poor and the sick, but worships the acquisition of money and great wealth,” Sanders said. The senator listed the facts of American inequality that fuel his campaign — the top one tenth of the one percent owns nearly as much wealth as the bottom 90 percent; the wealthiest nation in the world boasts a 20 percent childhood poverty rate. Each statistic was paired with a call for his audience to consider whether the policies that produce such outcomes are consistent with biblical justice. “When we talk about morality and when we talk about justice, we have to, in my view, say that there is no justice when so few have so much and so many have so little,” Sanders added. There was a time when American evangelicals lent their support to liberal economic policies, helping to elect Jimmy Carter to the presidency in 1976. This election cycle, many evangelicals — who now reliably vote for Republicans — support Donald Trump, a strange turn of events that makes Sanders’s appeal look like less of a Hail Mary pass. Sanders’s attempt to tap into that long-lost strain of evangelical economic populism was met with respect at Liberty, a few of his lines even drawing cheers. None of the questions posed during the Q&A session that followed Sanders’s speech challenged the premises of his economic platform. Even the morning’s most contentious question applauded Sanders’s defense of economically vulnerable children, but asked why he doesn’t recognize that children in the womb are the most vulnerable in all of America. Sanders responded by invoking conservative arguments about the need to restrict the government’s interference into women’s personal decisions. He then shifted attention back to the plight of those who are already born. “When you talk about issues of children, the Republican budget threw 27 million people off health care, including many children,” he said. The question received far more applause than its answer. With evangelicals deeply alienated from the Democratic Party’s social liberalism, it seems unlikely that any Democratic candidate can strip a significant portion of the evangelical vote away from the GOP. Sanders acknowledged this reality early in his speech, but then offered a kind of prayer that together he and his audience might transcend it.